It doesn’t matter that most homes aren’t sold with all of the contents included; good decor helps prospective buyers fall in love with a property. That’s why staging real estate listings can be so powerful. The best and most current decor trends. 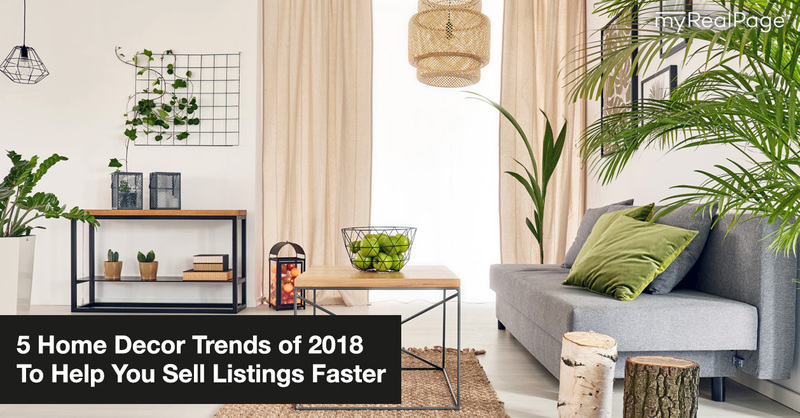 In this post, we’re giving you the rundown on the top home decor trends of 2018 and how they can help you stage and sell homes faster. 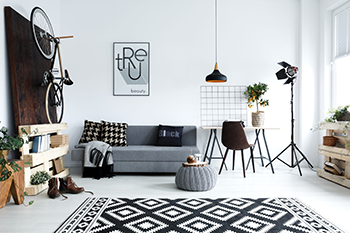 In July 2018, American blind and shade company Next Day Blinds published the results of their research into the home decor items that Americans googled most in the last year. The most searched-for item? Trays. Wood trays that rest on an ottoman and contain a television remote, drink coasters and a photography book. Or lucite trays to hold a candle, matches and a notepad. Or gold-mirrored trays for bar supplies, like fancy cocktail glasses and chic napkins. Trays like these are hot because they serve as both storage and a decor item that adds visual interest. They’re available in all kinds of aesthetics and at various price points, making them a flexible and accessible way to dress up various rooms in your listings. Wicker as a summer-only material? Not anymore. Fringe, crochet and woven textiles are just bad 70s leftovers? No way. Woven textures showed up in a big way this year. Think: fringed throw pillows, wicker storage baskets and nubby, vintage-inspired wall hangings. Moderation is key here; try a large-scale wall hanging on a bedroom wall or wicker baskets containing a couple throw blankets in the living room. Palms, monstera leaves and hibiscus motifs have showed up on everything from shower curtains to wallpaper to throw pillows to coffee mugs. The tropical trend is a nice way to incorporate graphic touches without being too abstract. But it’s not for every home; a palm tree print will be out of place in a house otherwise filled with antiques, for example. Turn to this trend when you’re selling a minimalist or austere home that could benefit from some warmth and personality. Tropical vibes can also be a great addition to an already maximalist or vibrant aesthetic. Speaking of maximalism, it’s back after years of being overlooked in favour of minimalism. We’re talking layered textures, colours and patterns – sometimes in surprising combinations. Forget less is more; we’re all about ‘more is more’ now. The overall effect is whimsical and creative, which can feel inviting and warm. It can be difficult (and expensive) to start creating a maximalist room from scratch, so save this trend for listings that already have the foundation of a maximalist aesthetic. Houseplants never went out of style, but they’ve never been hotter than they are this year. Whether it’s because of a desire to counteract our increasingly digital lives or simply because they’re relatively inexpensive and impactful decor, having an overabundance of house plants is a trend in and of itself. We don’t mean a plant in each room; we’re talking rooms with plants on nearly every surface. Like maximalism, but with plants. This trend can be applied in ways that achieve a myriad of looks. Add climbing vines and leafy palms to a maximalist artsy home. A more classic space, dominated by white walls, could be livened up with orchids in a variety of colours and sizes.